My patients have been, and always will be, my first and only priority. 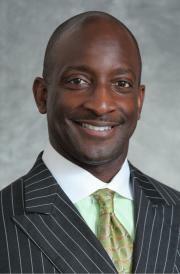 Dr. Echols is a board certified orthopedic surgeon with fellowship training in shoulder and elbow surgery. He was born in Knoxville, Tennessee. He received his undergraduate training at the United States Naval Academy and attained his medical degree from Meharry Medical College in Nashville, Tennessee. Dr. Echols performed his orthopedic surgery residency at Portsmouth Naval Medical Center and completed a shoulder and elbow surgery fellowship at Florida Orthopaedic Institute. He was a four-year recipient of both the Armed Forces Health Professions Scholarship and the Southeastern Regional Education Board Scholarship. Dr. Echols has authored research publications and presentations in the areas of hand, elbow, and Achilles tendon ruptures. He continues to be actively involved in research. Prior to joining Florida Orthopaedic Institute, Dr. Echols served on active duty in the United States Navy, attaining the rank of Commander. Dr. Echols performed a tour of duty in Iraq where he served as the Officer-in-Charge of a Forward Deployed Surgical Resuscitative Unit. Upon his return from Iraq, Dr. Echols served as the Head of Orthopedics at Naval Hospital Camp Lejeune. Dr. Eddy Echols was heaven sent! He performed my mother’s shoulder surgery and his etiquette and knowledge was very impressive. Thank God for him and the whole Florida Orthopaedic Institute. You guys rock! Dr. Echols is awesome. Lets just say he is very, very good at what he does. Personable staff and his assistant was just as nice and informative as Dr. Echols. The entire staff on the doctors side was exceptional. Checking you in and out with efficacy and always smiling faces. The Physical Therapy Department’s check-in and check-out staff were all very efficient, very pleasant, and accommodating to your needs. The Physical Therapists that I came in contact with were again, exceptional. Sorry, I cant remember all the names but Kevin was awesome. He always took time to explain to me exactly how to do the exercises as I am one that needs exact instructions. Can’t even say enough good things about Florida Orthopaedic Institute. Would not be afraid to have surgery again with this crew to help you along the way. Thanks so much to all of you! Dr. Echols came to my rescue on March 29, 2017. I had issues with my right shoulder for over a year. I completed physical therapy and received injections in 2016 from another facility that only lasted a short period of time. Dr. Echols was honest and straight to the point after reviewing my MRI. Dr. Echols and his staff did an outstanding job of nursing me back to health and ensuring I had the mobility I needed to return to a normal life. Thanks a million to him and his wonderful staff. You guys are awesome and do amazing work! Dr. Echols, my knight and shining armor, came to my rescue on March 28, 2017. I had issues with my right shoulder for over a year. At the beginning of January 2017, I started noticing my right shoulder becoming extremely limited in movement. I could not raise my arm or sleep on my right shoulder. Any movement in this area caused excruciating pain. This was going on far too long and getting worse over time. I scheduled an appointment and saw my primary doctor on February 1, 2017. My doctor requested a MRI and referral to an orthopedic. I completed my MRI on February 20, 2017 and picked up my report on March 9, 2017. 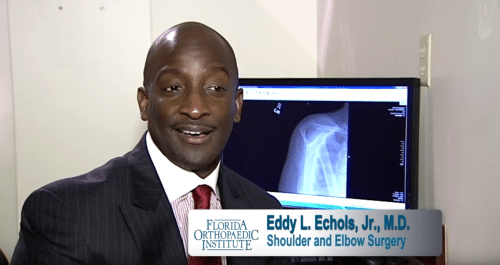 Florida Orthopaedic Institute scheduled my first appointment with Dr. Echols on March 28, 2017. Dr. Echols was honest and straight to the point after reviewing my MRI. We both knew that doing physical therapy again was not an option and could only make things worse. Dr. Echols and his staff jumped into action immediately to get me the first available date for surgery. I was scheduled March 29, 2017. Six months after recovery and physical therapy, I am happy to report I feel like a new human being without the aches and pain. Dr. Echols and his staff did an outstanding job of nursing me back to health and ensuring I had the mobility I needed to return to a normal life. September 21, 2017 was my official release date from Dr. Echols’ care. If I ever need surgery in your specialty, I will definitely return to your office. Thanks a million to my knight and shining armor and his wonderful staff. You guys are AWESOME and do AMAZING work!!!!!! Dr. Echols is awesome, lets just say he is very good at what he does. Personable staff and his assistant was just as nice and informative as Dr. Echols. The entire staff on the doctors side was exceptional, checking you in and out with efficiency, and always smiling faces. The Physical Therapy Department check in staff and check out staff were all very efficient, pleasant and accommodating to your needs. The Physical Therapists that I came in contact with were again, exceptional. Kevin was awesome and always took time to explain to me exactly how to do the exercises as I am one that needs exact instructions. Can’t even say enough good things about this Florida Orthopaedic Institute. Would not be afraid to have surgery again with this crew to help you along the way. Thanks so much to all of you! I am writing this letter to thank you for your gifted hands repairing my shoulder tears and bicep tendon. I want to thank your nurse, physician assistant, and all of the physical therapist I have had the pleasure of receiving care under. Florida Orthopedics Institute staff members were all educators, caring, kind, and attentive caregivers. Omar Abadie is a motivated and very focused on my needs with recovery. My progression to full range of motion following my shoulder surgery was done with minimal pain. He asked with every therapy if I was experiencing any pain when performing all exercises. His gentle stretching, and warming up helped with my performing the therapies. He is dedicated and an asset to your institute. I was lucky to receive care from him with the majority of my visits. Florida Orthopedics Institute is equally lucky to have him as an employee. Arthi Sainath, Jason Schoonover, and Shannon Terrell were all equally amazing therapist. They were all focused on delivering my therapy and were all professional. The Florida Orthopedics Institute secretaries are all pleasant, professional and attentive to my scheduling appointments . I was greeted every time I entered a therapy appointment, and feel like a valued patient. I injury occurred August 7, 2013. I was in constant pain and not sleeping well. The surgery was done on February 3rd, 2014. I was informed that it would be about 4 months to full recovery. I performed the exercises at home two times a day as prescribed. The therapy I received and with the home therapy my pain is down to a minimum. I do not experience constant pain and have been sleeping better. It is now 2 1/2 months ans I am working on regaining my strength. My experience with FOI has proven to be an uplifting road to recovery. The process of my shoulder replacement was a scary thought. After meeting and talking with Dr. Echols and Obourne, PA, a feeling of peace came over me. I was confident in their ability to perform surgery. I am so pleased with anyone whome I have dealt with. thank you all very much, you guys are the best! I had rotator cuff surgery on 1/7/2015 by Dr Echols and the awesome staff at Florida Hospital!! Everything was flawless and the care was over the top! Special kudos to Dr Howell(anesthesiologist) and his staff for taking great care of me!! I love the extra details and explanation Dr Echols took in making sure the procedure went well! I just love, love, love how thorough and detailed he is. I’m extremely satisfied and grateful for his expertise in the area of Orthopaedics!!! Woohoo!! At the age of 55 on Feb. 28, 2015, I fractured my knee cap (medically diagnosed as a non-displaced fracture…no surgery needed). It was very painful as I arrived to Dr. Echols on March 3. I was in tears of what was ahead. It was my first experience with a break. As soon as I entered the Florida Orthopaedic Institutes office, I was welcomed with smiles from front desk receptionists. Their concern was to make me as comfortable as possible while I filled out paperwork and waited to see the Dr. It was not long before I was back in the waiting room. They immediately took x-rays and I was soon in the presence of Kevin Osborne, PA and Dr. Eddy Echols. They gave me me great relief in knowing that I would recover completely if I followed all directions. Six weeks later I was ready for physical therapy and introduced to Lori Amaden & Omar Abadie whom were within the same building. They worked with me one on one with therapy to help strengthen and restore my range of motion. They gave me detailed exercises to continue at home. I want to thank each and everyone of these amazing professionals who helped heal me. I have fully recovered and am ever so grateful! I recommend this great team to everyone.